BCB offers a complete style and grooming experience through our manicure and pedicure services. Manicure and pedicure not only help hands and feet to feel better, they will look better as well. 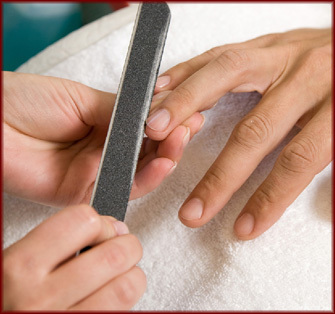 The word "manicure" is derived from a Latin word that literally means care for your hands. Manicure treatments not only involve hands, but fingernails as well. How our hands and fingernails look reflect how well we take care of them, and their appearance may affect first impressions that we leave. The main purpose of manicure is to make people look and feel good about their hands and fingernails. It is very popular and works like a fashion accessory, because there is a wide range of products that can be used for fingernails. Other purposes of manicure are to prevent nail damage, and to treat sore or broken skin around the nails. Hand massages, which are usually a part of manicure treatments, help to improve blood circulation around the hand and fingernails, and decreases the rate of wrinkling. Basic manicure treatments include shaping and filing of nails, buffing, removing of cuticles, a quick hand massage and applying nail polish. Examples of other types of treatments include the use of warmed paraffin wax to moisturize and smooth the hands. Similar to a manicure, a pedicure is a beauty treatment for our feet and toenails. Our feet usually get neglected because we tend to pay more attention to our faces and hands. However, we should give them a little more attention if we want our feet to look healthy and beautiful. When our feet do not feel good, we may not be able to walk comfortably and that could affect our appearance and confidence. A pedicure is able to prevent many foot problems like calluses, in-growing toenails, toenail infections and cracked heels. A pedicure treatment also involves massaging the feet. Since there are many acupressure points in our feet, foot massages can be very soothing and relaxing. A basic pedicure involves soaking the feet in warm water, massage and trimming of the toenails. In order to further soften and moisturize the feet and nails, it is common for pedicure treatments to include the use of paraffin wax as well. Nails are then filed and shaped.